In 2018 we invited three local artists to create a new theme for our Christmas in Grant event! "Whoville" was created by Liz Olmstead, Regan Dykes, and Tracey Stebelton-Hargreaves. Additonal stage set pieces were on loan from LionHeart Productions. LionHeart also sent Whoville Characters to mingle with everyone who attended our event. Cindy Lou Who was here meeting all of our local kids. THANK YOU to everyone who sponsored, volunteered, donated, and to those who spent a better part of the day with us on December 8th. We could not have done it without you! 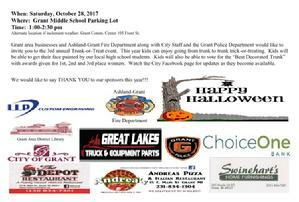 THANK YOU to our Major Sponsors: Andrea's Pizza, Swinehart's Home Furnishings, and Infrastructure Alternatives. Additional Sponsors making this event possible: Gene's Family Market, Grant Police Department & Staff, the Rodriguez sisters, Michelle McKinley, Grant Area District Library, Wesco, Beaver Tree Service, The Depot, Old Iron Bar & Grill, MHK Equipment, Great Lakes Truck & Equipment Parts, and Smart Energy Solutions. Soon we will be planning Christmas in Grant 2019!!! We are always in need of more sponsors and volunteers to make 2019 another successful, free family event. If you know anyone who might be interested in sponsoring or volunteering, please have them e-mail staff at City Hall. We also need volunteers to can help make additional Whoville themed stage set pieces. 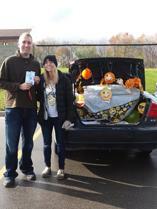 2017 Trunk Decorating Contest Winners! Although it's not a City sanctioned event, the Grant City-Wide Yard Sales happen every year like clockwork because of the date consistency...."always the first Saturday after Labor Day Weekend." People can always figure out when Labor Day weekend is, so they just plan on the yard sales. The City is full of thousands of people hunting for treasures that day every year! This year, the sales are Saturday, September 9th. On May 13th 2017 the 2nd annnual RUN YOUR CITY OF GRANT in partnership with Amputee Blade Runners will take place at the Middle School Track. This will be a run/walk of 1 mile that is designed to bring attention to Amputees. Running prosthetics are NOT covered by insurances and considered “not medically necessary” so Amputee Blade Runners a Non-Profit organization that helps provide free running prosthetics for amputees so they can keep an active lifestyle. Grant Michigan is very lucky to have our own Amputee Blade Runner Brooklyn Olin. Brooklyn a 5th grade student at Grant Public Schools is one of the most sweetest, loving and caring girls you will ever meet, she plays basketball with Upward in the winter and plays softball with Grant Little League in the spring. So please make plans on May 13th from 10am -2pm to walk/ run a mile around the track. 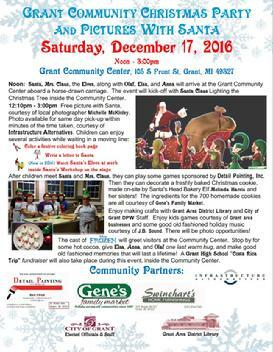 We will have RUN YOUR CITY OF GRANT apparel forms from DanMark of Casnovia Mi. will be available on our Facebook page so you can purchase apparel, the money raised from apparel will go to help with costs occurred for Brooklyn’s family as they maintain her prosthetic blade runner leg. Contact Brian Chesebro at 231-206-8758 or by email: bchesebro@northernboiler.com with any questions. Rain or shine, the annual Citywide Yard Sales will go on! New this year, the City is renting ten foot by ten foot spaces inside the Community Center for only $20. Individuals looking for dry, climate controlled space to sell their goods will be provided use of two six foot lightweight tables and plenty of chairs. We even have one space available for a local non-profit to use at the edge of the stage. Below is the layout of the spaces available for rent. Stop by the City Offices to reserve your space today! On May 28th 2016 the 1st ever RUN YOUR CITY OF GRANT in partnership with Amputee Blade Runners will take place at the Middle School Track. This will be a run/walk of 1 mile that is designed to bring attention to Amputees. Running prosthetics are NOT covered by insurances and considered “not medically necessary” so Amputee Blade Runners a Non-Profit organization that helps provide free running prosthetics for amputees so they can keep an active lifestyle. Amputee Blade Runners goal is to provide a running prosthesis to one athlete in all 50 states by 2016. They currently have athletes in 24 states who serve as ambassadors to other amputee athletes. The 2016 Walk for Autism theme is SUPERHEROES! We know we have many heroes in our community—our fire dept., our police, our EMTs, our nurses and doctors, teachers —so, we are reaching out to all of the Newaygo County community heroes and asking each of them to join us as we Walk for Autism! The 2016 Walk for Autism was April 30th, 9:30am, at the Fremont Football Field. The CDC estimates that 1 in 68 children has been identified with ASD. In Newaygo County, we have about 110 children that are receiving services for ASD. Children with autism grow up to be adults with autism. The Newaygo County Autism Community is committed to raising autism awareness so that we can achieve autism acceptance in our communities. We are parents, school professionals, and community members who actively seek to support and advocate for persons with Autism Spectrum Disorder (ASD) and their families. We strive to increase Awareness, Support, & Acceptance throughout Newaygo County for persons on the Autism Spectrum and their families. We do this by providing support groups, social and community activities, information & resources, and raising public Autism awareness throughout the year. Please consider participating in the Walk for Autism this year. The City of Grant free annual clean-up event will be Saturday, May 7 thru Wednesday, May 11. 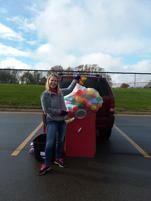 City residents and taxpayers are able to drop off junk (non-hazardous) into the dumpster. Please plan ahead to arrive early as we have only one dumpster. Once the one dumpster is full, the event is done. For a List of Items we CANNOT ACCEPT, please refer to the center file below. Contact the Newaygo County Board of Public Works for information on their "Household Hazardous Waste" collection day on the file below on the right. This is has been scheduled for June 4, 2016 June. Their event occurs one day annually. Be sure to check out the website of the River Country Chamber of Commerce and the Newaygo County Convention and Visitors Bureau for their calendar of upcoming events as well. A group of creative, enthusiastic, and community-minded volunteers have collaborated on creating a Halloween Party and Movie Night in the Park at Blanche Lake Friday, October 30th. 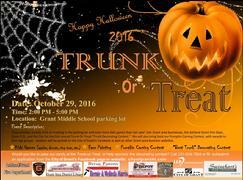 This event includes a "Trunk-or-Treat", face painting, pumpkin painting, and a variety of kids games. We also have a pumpkin carving contest (carving done at home ahead of time) sponsored by Old Iron. Our event sponsor is ChoiceOne Bank - Grant Branch! 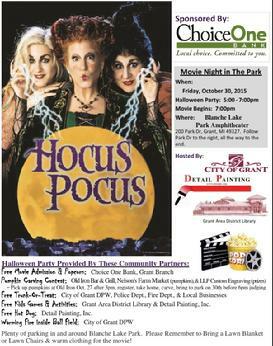 This event end with a showing of "Hocus Pocus" at the Blanche Lake Park Amphitheater. It's going to be cold, so please dress warm for the movie. A warming fire will be on-site within the ballfield. Please check back for any last-minute updates if the weather forecast changes between now and then. Our back-up location is the Grant Community Center, but our preference is to keep everything at Blanche Lake Park. Thank you ChoiceOne Bank for Sponsoring this event! The September movie showing: "Cloudy With a Chance of Meatballs" on 9/05/15. 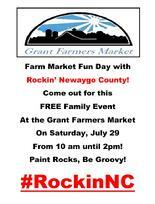 Hosted By: City of Grant and Detail Painting, Inc. The July movie showing was "Blended" on 7/25/15. Thank You to our Sponsor: ULRICH PROPERTIES in Grant. 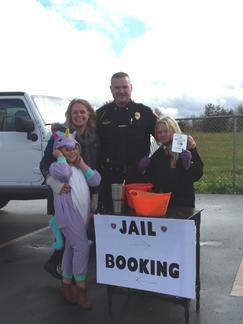 Another Thank You to Shawn and Janet Botsford of the City's DPW for donating popcorn. The June movie showing was "Alexander and the Terrible Horrible No Good Very Bad Day" on 6/27/15. Thank you to our sponsors: DETAIL PAINTING, INC. for sponsoring our June movie! The Grant City-wide Yard Sales are always the first Saturday after Labor Day weekend. This year the event will take place on Saturday, September 12th. The new farmer's market will also be open for those interested in locally grown fresh fruits and vegetables and locally baked goods. Market stalls need to be reserved ahead of time. Yard sales are not allowed at the Farmer's Market structure. Cooking up more than a weekend of Farm to Table events and activities. This year's entertainment lineup featured a taste of great music to please any palate. Featuring rock, country, blues playing Friday and Saturday. Craft brew beer tent featuring craft beers made from local ingredients. A Taste of River Country featuring Newaygo County's best Farm to Table cuisine. There was be plenty of family fun and entertainment with games and events like an Onion Eating Contest, Tractor Show, Kids games, Parade, Kid's Stage, and Arts & Crafts with a fresh flair. A Taste of River Country took place Friday & Saturday August 14-15 at Blanche Lake in Grant, MI. For more information, call 231-652-3068 or check the website www.rivercountrychamber.com. 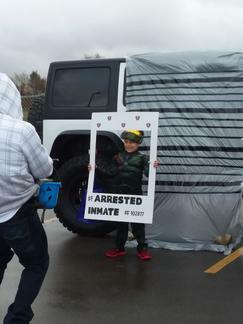 The 2014 Grant Christmas Festival took place on Saturday, December 13, 2014. Santa and Mrs. Claus, along with Olaf, Elsa, and Anna from the cast of "Frozen" arrived on a horse-drawn carriage at 4:00pm between the Depot and the Grant Community Center. 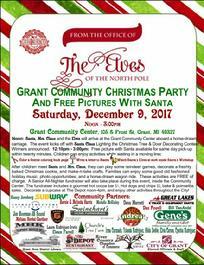 Santa and Mrs. Claus met with children at the Grant Community Center until 7:30pm, and the cast of "Frozen" met children under the warming tent until dark. At the Community Center, good boys and girls waiting patiently in line to meet Santa Claus received a free picture taken with him. Mrs. Claus was also available for pictures upon request. Other activities included decorating a cookie (while supplies lasted), making Christmas crafts, racing Matchbox cars, and listening to Christmas music provided by JB Sound throughout the event. Everything was free of charge. Outdoor activities included a free horse-drawn carriage ride on Front Street, roasted chestnuts at State Farm Insurance on E Main Street, and a warming tent serving complimentary hot cocoa and coffee. The warming fire and tree lighting were held at Water Tower Park, and Santa Claus made surprise visits at several of our downtown businesses. A special thanks to all of our event sponsors, our volunteers, and of course the members of the River Country Chamber of Commerce. Without this community support, this event might not be possible. The City of Grant staff cut back on decorations for 2014, but we were pleased to be a part of this holiday fundraiser. 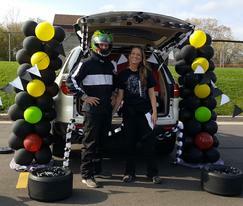 Half of all proceeds went to the Newaygo County Commission on Aging Senior Meals Program. When: December 2-31, 2013 This event raised $607.14/ Croton Bay Trading Post raised $178.25 and The Lighthouse Group Insurance raised $150.00. Half of the proceeds ($303.57) will go to the True North Senior Food Program, and the other half will go to the Chamber of Commerce. The winner was determined by the business raising the most votes. Online votes are billed on an actual invoice for this contest. The 2013 Santa Express & Annual Christmas Party took place on Saturday, December 14, 2013. Santa and Mrs. Claus arrived at 11:25am at the Depot, and met with children for about fifteen minutes before being taken to the Community Center on a horse-drawn carriage. At the Community Center, children waited patiently in line to meet Santa Claus and get a free picture taken with him. They also enjoyed decorating a cookie, making Christmas crafts, racing Matchbox cars, and listening to Christmas music through out the event - all free of charge. A special thanks to Wayne Dault of Marquette Rail and all of his volunteers! A huge thank you to all of our event volunteers, as well as the members of the River Country Chamber of Commerce who make this event possible. This event always takes place the first Saturday after Labor Day weekend, making it Saturday, September 7, 2013. This event is not sponsored by the City of Grant or even the Chamber of Commerce. It just occurs every year on its own. If you are interested in setting up tables for a yard sale within the City limits, you should contact the property owner for permission well in advance. Please be advised the any any activity along M-37 is regulated the Muskegon Transportation Service Center (TSC) of the Michigan Department of Transportation (MDOT). The number to contact the Muskegon TSC is (231) 777-3451. The City of Grant is not allowing sales on any City owned property. Grant Festival 2013 took place on Friday, August 16th through Saturday, August 17th. The location was the same as last year: 360 S Maple (M-37) next to Rent Smart and Never Enough Auto. The Chamber of Commerce hired Kasey Jernberg as the Grant Festival Coordinator. All event entry forms and flyers are made available on the Chamber of Commerce website. 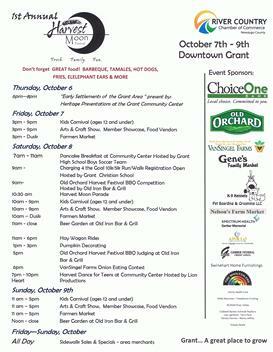 The Grant Festival is a Chamber of Commerce event. While the City of Grant is a paying member of the Chamber of Commerce, the City does not host or run the Grant Festival. This is a common misconception. Our membership representative as well as many City employees volunteer time and efforts to help out with Chamber of Commerce events, the same as many other business representatives do. They are not paid to volunteer or help out with this or any other community event. 2013 Day at the Lake~Free Community Event! Take State Rd (120th) east to Park Drive, turn left at Grant Elementary. See map below. What: Enjoy hot dogs, chips and beverages along with volleyball pick-up games, horseshoe pit, meet and greet your Grant Medical Office Providers, kayaks and canoes available for use, kids' games, fishing (some gear provided), and giveaways. As a fun and festive fundraising event to help purchase holiday themed banners for the new L.E.D. streetlights in the downtown, the Chamber of Commerce is once again sponsoring a Holiday Decorating Contest among its members. Essentially, guests were encouraged to vote for their favorite decorated member business by casting their "vote" with spare change. The funds raised will be combined with the $322 raised in 2011 to purchase new decorations for the newer L.E.D. streetlight poles in downtown Grant.